This very fruity wine from Apulia is just well gorgeous. Apulia produces some very very good wines. Known for concentrated, high quality fruity wines. Appassimento, the term meaning “passed over”. The grapes are picked and then laid out on reed mats to dry, literally being passed over until they are over ripe. This gives them a “sweetness”, a soft velvety smoothness that is so so good. This wine has all of the above qualities and more. The big bold bouquet opens up and brings the garden to life inside. Violets, roses and cherry blossoms abound. The taste of of tobacco, spice and cherry jam cascade through the senses, erupting in a war of flavor, oh, oh, oh. Juicy, jam.. What a fantastic pleasure!!!! Look at that dark juiciness just begging you to partake. This is a must have. My mouth is watering just looking at it!!! Yea, this baby got back and she’s stacked. This voluptuous wine soothes and excites all at the same time. Like listening to your favorite Barry White song with an exotic dancer moving slowly in front of you. There is so much depth to this wine. So many elements competing for attention. The aromas erupting from the bottle your olfactory system (yes I had to use that word) will go into overdrive. Plum, violets, cherry blossoms and more fill the room starting the hypnosis that will eventually set in. Once in your mouth your body will hit nirvana. That peaceful feeling that leads you into bliss. All of the flavors pop in your mouth like an eruption. Each flavor taking its turn at lead. Like the sirens of lore beckoning you, your body eases into complete relaxation. What a wonderful feeling. Very lite tannins follow a very long finish.Pure pleasure. I enjoyed this with a little afternoon snack. Needless to say the rest of the day was ecstasy. So I start this by trying to decide if I shouls talk about Montalcino or Brunello. So, in a compact I will try to give a little of both. Montalcino is an area of Tuscany most famous for Brunello wine. Montalcino also gives us Rosso di Montalcino, and some “Super Tuscans”. Some sweet white wines are also produced there. Brunello is the most famous wine from the region made from Sangiovese. Brunello was the first to be awarded DOCG (Denominaziione di Origine Controllata e Garantita) status. Basically a controlled designation of origin. Brunello is aged 5 years with Reserva 6, (what we are having tonight). 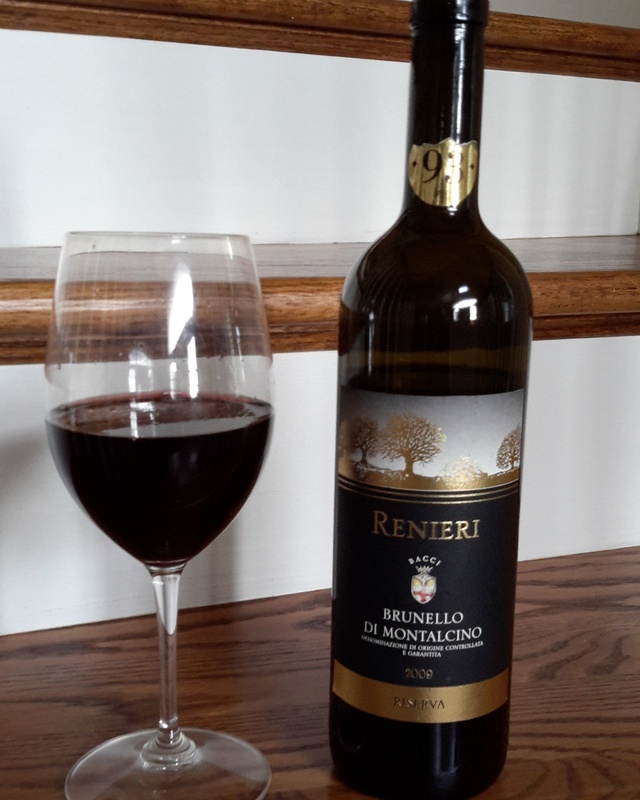 This Brunello is from Renieri, (Bacci wines ) a highly respected winery which produces several brands from the estate. When I opened the bottle I was struck immediately by the fragrance. So inviting, very foral but also very fruity. The liquid is very dark and seems dense. When the juice hits your tongue -rapture- I can hear the angels singing. Luscious, velvety smooth. Evidence of a master creator, for the wines and vineyards. Huge fruit tones; currant, plum, black cherry. These are accompanied by licorice, oak and cedar, smoky tobacco and hints of cocoa. Who couldn’t love this right? Just thinking about it now is causing my mouth to water. The finish is long and bountiful. This wine is also meant to be shared with a big meal. I am thinking a big steak with some sort of heavy side like a hearty mac n cheese. 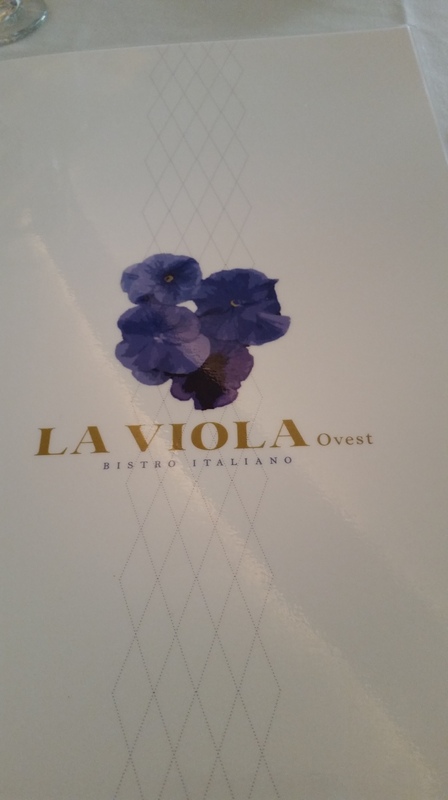 On our monthly night out in the city we chose La Viola Ovest. Highly recommended by several friends and very much worth it. On this night we met a couple of friends for dinner too. 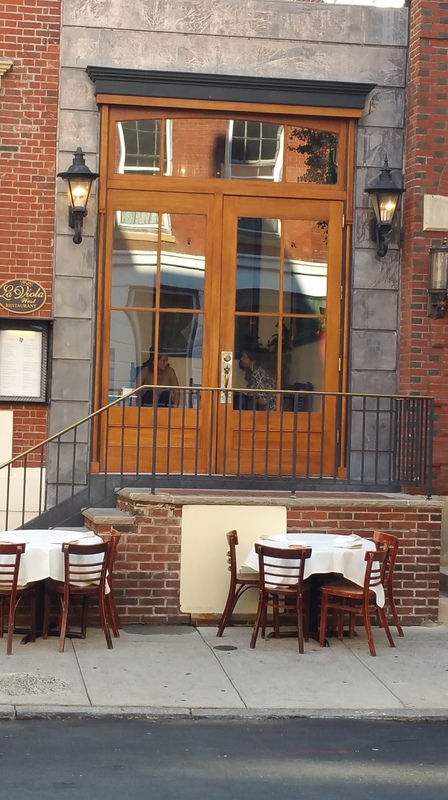 The quaint restaurant sits across the street from its sister La Viola. The night was great, EXCELLENT food, great wine, and conversation with good friends. We started talking and enjoying ourselves I forgot to get pictures of the food and wine. We ordered appetizers for the table and then we each had our own entrees. 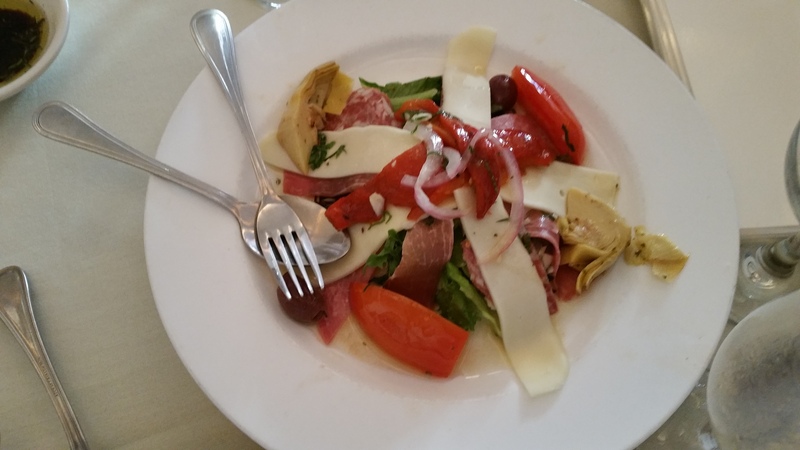 Calamari, antipasto and mozzerella with roasted peppers I paired them with a wonderful white from Langhe .DELICIOUS. The entrees were all shared, various forms of pasta, shrimp, ham and spinach, but the winner that night was by far the pork chop. Grilled to perfection, seasoned mouthwatering goodness. Oh my lovely. I brought two reds to go with the entrees. The Villa Lanata Langhe Baccanera and the Accordini Valpolicella Ripasso. Both excellent wines and both went down very well. The Baccanera, full bodied fruit forward and bold. A blend of cabernet and barbera. Dark fruit, plum, ripe dark cherry, Solid tannins that paired with the meats made the wine luscious. Just luscious. 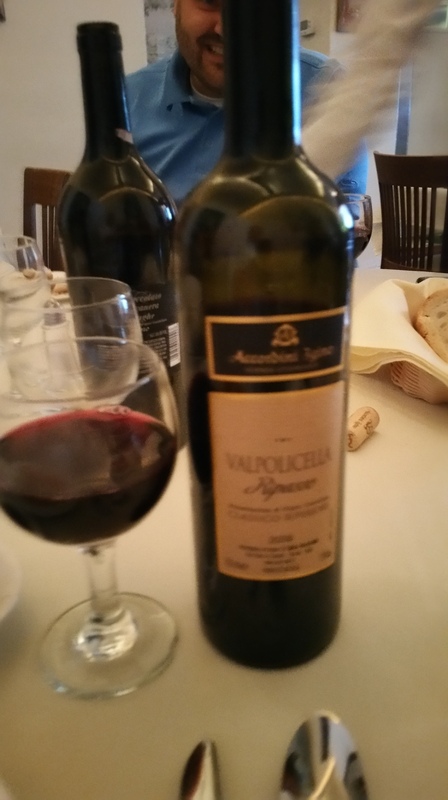 The second was Accordini Valpolicella Ripasso. As soon as the bottle was opened everyone around the table let out a perfect oohh. The aromas of the fruit balanced with the floral fragrance was so inviting. The taste hit my buds and almost brought tears to my eyes. Cherry, pepper, and a chocolate note bounced around my mouth delighting me. The wine was almost dense in texture, full, rich, fruity perfection. 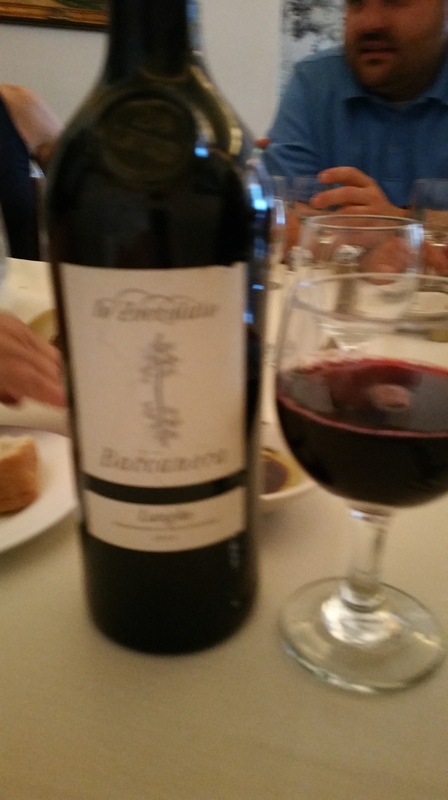 The Baccanera, horrid picture but excellent wine. my pictures are horrid tonight, but granted it was a very good night.